It has been an exciting 6 weeks here in Sapporo, Japan thus far. We wanted to drop you a quick email to say hello and give you a brief update on our life and ministry. First off, we are SO thankful for the outpouring of love, support and prayer from many of you. We so appreciate communication via email & Facebook with inquiries on how we are doing and finding out updates on your lives. I know many assume missionaries are so busy that we don’t have time but we make time to hear from you. Thank you and keep it coming. Family Life: We love life here in Sapporo. The community we are experiencing at Grace Church Sapporo is such a gift. Multigenerational love for one another that is uniformly committed to each other and God’s mission to reach Sapporo with the gospel. Our kids are loved, cared for and instructed within the church family here. They love it! The kids are on a 3-week summer break so we are still trying to find a routine until they return in a couple weeks. We are loving the time together and Rachel is doing an amazing job of teaching them and giving them roles/jobs in the house. We love our little home and will be posting a video tour on the blog in the coming weeks. The Lord provided us with bikes (4 bikes for $200) so we ride them everywhere! The kids walk/ride bikes to the local park for soccer and games and also head to the local grocery store for ice cream or a drink. It is so much fun for them to life and experience adventure in this safe and beautiful community. –It’s a fit! : We are loving ministry here at Grace Church Sapporo! It is exciting & humbling to be used of the Lord as a part of their vision to reach the people of Sapporo, Hokkaido & Japan with the gospel. It is such a fit for both parties it was like a pre-arranged marriage! Praise God for His perfect plan & timing!! –Wednesday PM Training: We have completed 3 weeks of disciple-making training with 30+ Japanese believers at Grace Church Sapporo (I teach every Wed except one week each month–we took a break while STM team was here). They are hungry to learn and apply the training. 157 Japanese have personally heard the gospel of Jesus Christ. They are learning to invite people to Jesus and not just to church. Please pray for their continued boldness and that God will produce fruit. –Discipleship: We are diving into discipleship of a number of Japanese believers and it is so enriching. The goal of our discipleship is to share from our lives, examine the Scriptures together to learn about Jesus and find something to obey then ask the Lord to help us to believe and obey that week. Our discipleship time also provides us with accountability to make sure we are sharing with others and obeying the Scriptures. “Obedience leads to fruit!” – Steve Parlato In addition, Troy is continuing to disciple some students and adults in the US via Skype (diSkypleship). Troy & Rachel both continue to be discipled via Skype as well. –PRIME English Ministry: We have begun a weekly English outreach/discipleship ministry on Sunday afternoons called PRIME. It is a time of Bible study, music and community…all in English. We are using the T4T “Three Thirds” format and using the Sword Bible Study method to examine the 7 Stories of Hope developed by Jeff Sundell. The goal is to examine the Scriptures and identify what it says about God, what it says about man and find out what it asks of us. We rejoiced that there were 3 who trusted Christ after the first week! –Iwamizawa: Each month, we travel to the neighboring city of Iwamizawa where we are partnering with Pastor Nakajima of Grape Vine Church to provide teaching and disciple-making training. Alicia Bechtle teaches English at a college in this city so we are excited to see their gospel efforts being unified. –Castleview STM Team: It was a joy to have 33 Americans come from Castleview Baptist Church for 2 weeks of gospel outreach ministry and fellowship. The team was skillfully led by our dear friends, David & Naomi (Kamidate) Rawlins. Among the team members were many friends (including my dear friend, pastor Rick Cobb & Rachel’s discipler, Beth Timberlake + her daughter Mary Claire) as well as some of our family members (Karen, Amy & Stephen Long). 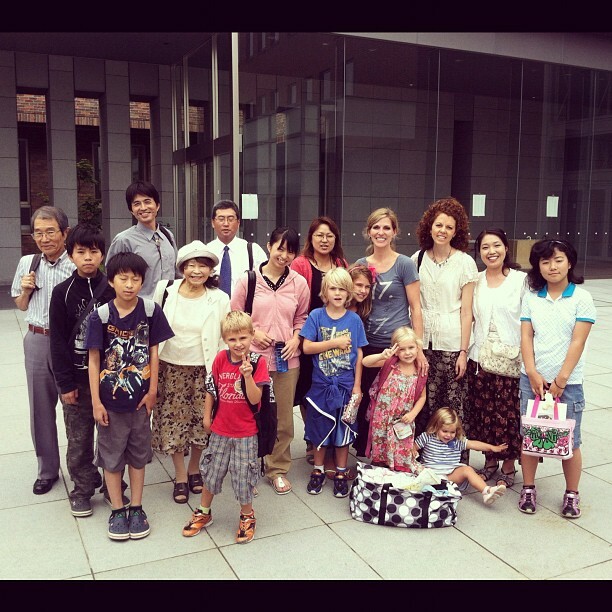 They all served as a encouragement to our family and the Japanese church members. They used choir and English coffee houses to reach over 300 people with the gospel. Please pray for fruit! Pray also for them as they return to Indianapolis that the Lord will continue to use them to reach the 85% unchurched in Indy with the gospel. 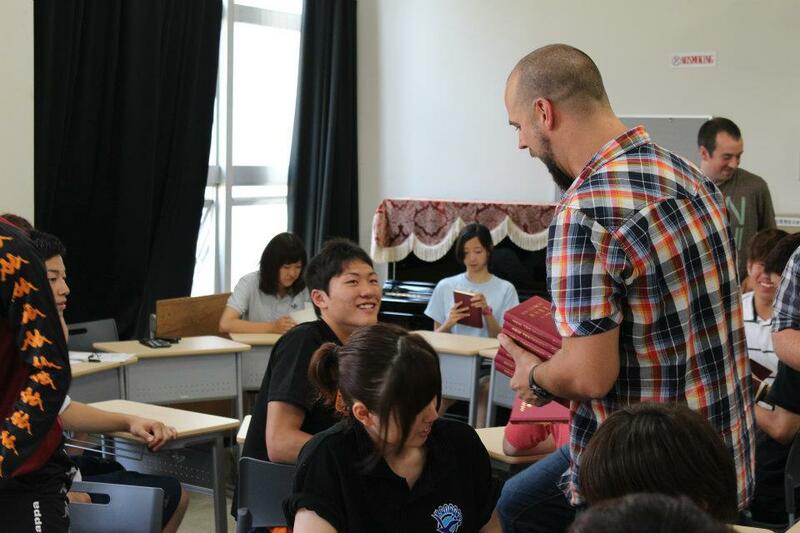 –Sharing at Iwamizawa College: While the STM Team was here we were able to share with the 50 Iwamizawa College students in Alicia Bechtle’s English class. We used a discussion of American holidays to share about the true meaning of Christmas & Easter and were able to give a clear gospel presentation. Sadly, none of them had ever heard the gospel before (pray for fruit). None of them owned a Bible. Praise God that all of them heard a clear gospel message and all of them received a Gideon English/Japanese NT Bible. Pray for fruit!!! –Rachel + kids = gospel machine: I love watching Rachel unleashed here in Japan. Everywhere she goes with the kids people flock to them and they always ask why we are here. Rachel then responds by telling them about Jesus. She never misses an opportunity and I love watching God use her so mightily! –Language Study: Troy is going to begin a 3-month intensive Japanese language program through a language school beginning September 12. He will have classes each Wed, Thur & Fri afternoon for 12 weeks. It will be a lot of work but he and Pastor Kamidate agree that it is worth the investment of time and money to get a basic foundation to build on this year. The cost of the school has been graciously provided by the Lord through Onward Church in Fishers, IN. -School + Summer Break: The kids are all on Summer break and return Aug 20. Mayah & Malachi will resume classes at Yamahana Elementary while Isaiah & Tessa will resume at a Lutheran Kindergarten. We love their teachers and are excited to see them learn, grow, pick up the language (should be fluent by Christmas) and connect with other families. –Photos: We are taking lots of photos and posting them on Facebook, our Blog and Instagram (“TroyTheCoop”). Because it is difficult to send photos through email we will not be attaching them to e-updates. Please let us know if you have problems viewing them at the provided means. –Date Night: Rachel & I are enjoying a weekly date night thanks to the babysitting of Moe Watanabe. Tuesday nights are an oasis of conversation and adventure together. 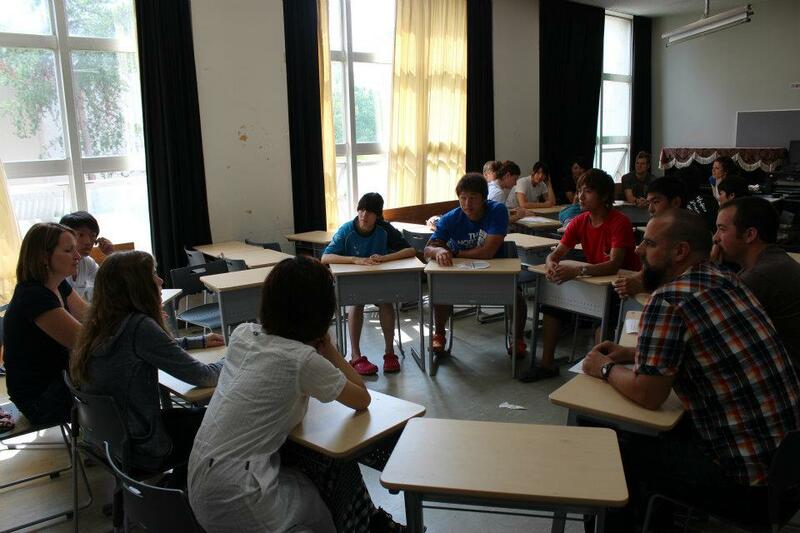 -Evangelism: We are praying that 150 people will hear the gospel each week by Japanese believers sharing with them. Pray for boldness & perseverance for the believers in Sapporo & Iwamizawa! –10 cities in Hokkaido: Pastor Kamidate’s vision is to see multiplying churches started in the 10 main cities on the island of Hokkaido and from these 10 cities they will reach the island. Please pray for God to raise up new disciples to reach Japan with the gospel! Thank you for your continued love, support, prayers and encouragement. We love you and praise God for you! We were able to share the gospel with 50 college students at Alicia Bechtle’s English classes through a discussion of Christmas & Easter. Each of them heard the gospel and received a Gideon NT Bible. Pray for fruit! 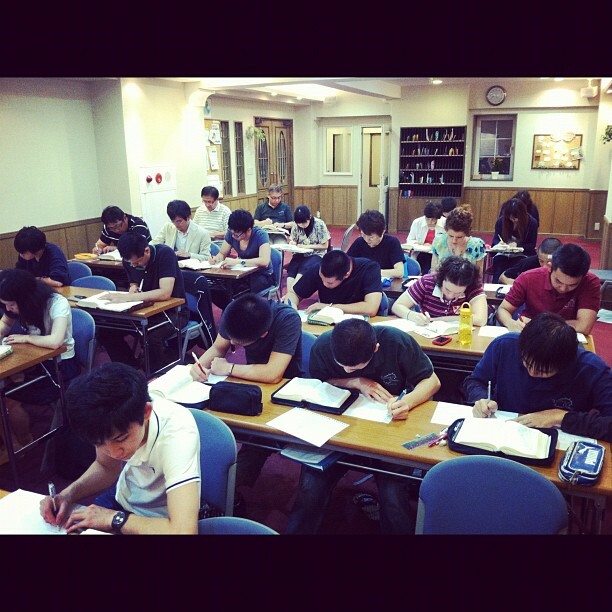 50 college students in Iwamizawa received Gideon NT Bibles after hearing the gospel. Please pray for fruit! Grape Vine Church Iwamizawa – Each month we travel to Iwamizawa to enjoy fellowship & lead disciple-making training among the Japanese believers there. Pray for fruit! 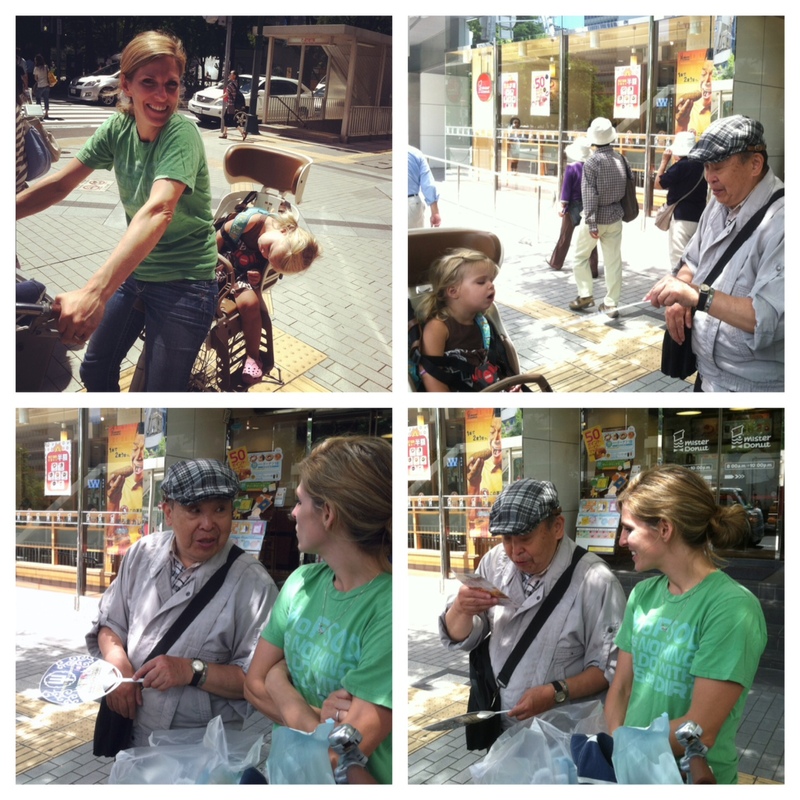 Super Team: Sleeping Lucy attracted the attention of a man whom Rachel talked to and shared the gospel with. She seizes these opportunities every day! Pray for fruit. Wed PM Training: Japanese believers at Grace Church Sapporo examine Matthew 28:18-20 using the 3-column Bible Study Method during weekly disciple-making training. 157 people have heard the gospel from these 30 thus far. Pray for boldness & fruit!